A resort town with many popular beaches, Alanya can get busy and crowded, especially during the summer months. Take a break from that on-season intensity and take a catamaran down the Riviera coast. Stop at numerous bays and coastal grottoes for swimming and snorkeling, including the eerie Phosphorus Cave and the intimate Lover’s Cave. 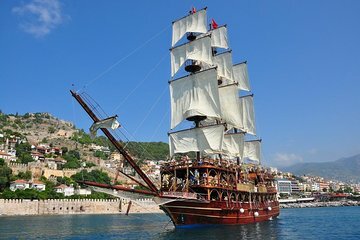 Sail past a range of coastal landmarks, too, including Alanya Castle and Kızıl Kule (the Red Tower).